My recent boardgame experience has been limited to looking at game images while working on the CBQ redesign (almost done! ), and briefly visiting the new LuckShack South – good luck guys, looks to be off to a good start (and thank goodness for some form of gaming venue close to my home – Paul and Stuart get all on the luck on their side of the world). Good news for fans of Wayward – IDW will be releasing a cooperative board game based on the popular comic series, designed by Jon Gilmour (Dead of Winter). 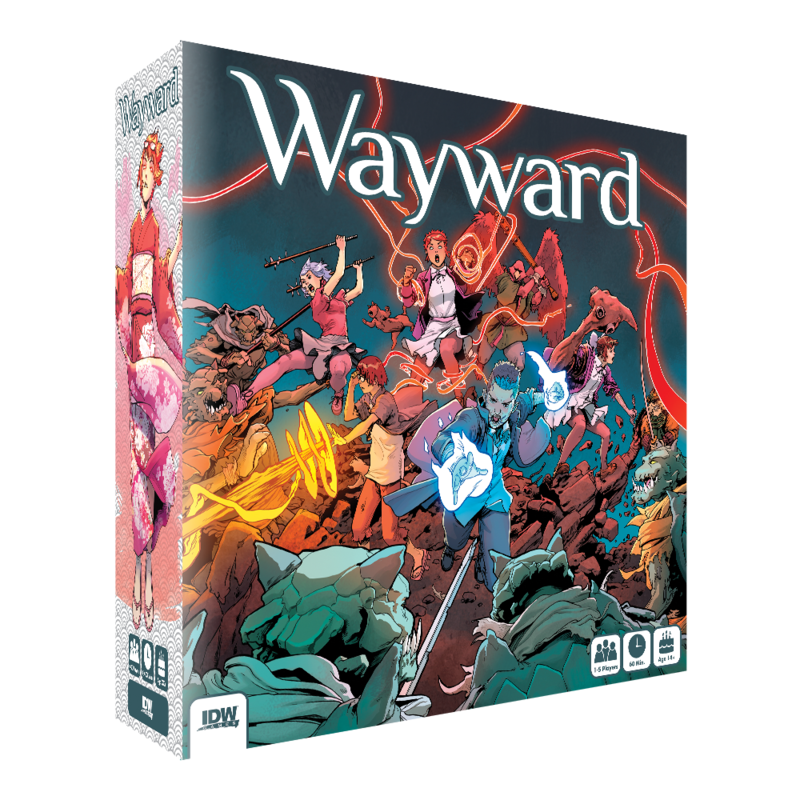 Wayward is a fully cooperative board game where players assume the roles of the comic’s heroes working together to defeat villains controlled by the game itself. Set in modern Tokyo, Wayward is an ongoing series published by Image Comics featuring teenagers imbued with supernatural power defending the world from Yokai, Japanese mythological creatures and spirits. Since launching in August 2014, Wayward has gained critical acclaim and a dedicated readership. 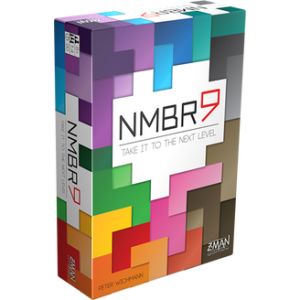 New from Z-Man Games comes NMBR9, a tile-stacking game, playable for 1 to 4 people. Players score points by creating their own displays of uniquely shaped number tiles. The higher a tile is in the display, the more points it’s worth — and the most points wins! To score big points, you’ll need to plan ahead and place your tiles carefully. Visualize your future moves to reach higher levels and solve this intriguing puzzle. At the start of each round, a tile is drawn with a printed number – the number of tiles each player must add to their “display” for that round. 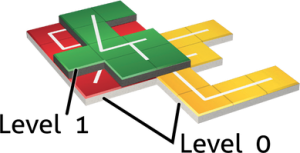 With varying tile sizes and a set of basic placement rules, players face a tricky quest to build the highest stack that they can – to score more points. Choices must be made along the way – do you score big as soon as you can, or do you plan for the future with a solid base first? Not strictly a new game, but Martin Wallace’s 2016 game The Arrival is getting an updated version with updated components and art, and also revised rules. The game will be published by Cryptozooic Entertainment, and will be released later this year. The animals have escaped, and are on the prowl…. well that’s not entirely true. 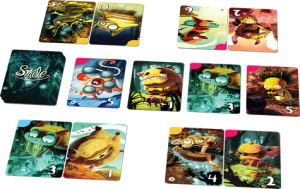 In Z-Man‘s new card game Smile, each player attempts to lure a collection of cute animals – preferably high-scoring ones. 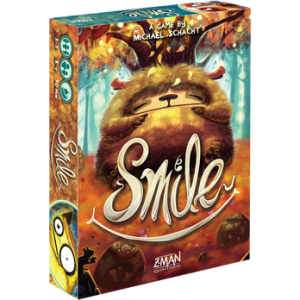 Z-Man Games is pleased to announce Smile, a card game for three to five players about rounding up the critters worth the most points. Armed with firefly-filled jars, you and your rivals spread out in search of the lost critters, each hoping to lure as many as you can. But be careful not to lure any wild critters by mistake! They look very similar to your tamed ones, but capturing them gives you negative points. Your goal is to be surrounded by a collection of cute little smiling creatures no matter what—just make sure to get the right ones! Pain. Violence. No mercy. If there was ever a game premise that would be described as “un-Canadian”, it would be Carthage. From first-time designer and life-long Canadian, Luke Seinen, comes the gladiator deckbuilding board game Carthage, serving helpings of strength and honour for 2-5 players. Carthage is a deckbuilding board game where players face off in gladiatorial warfare to earn crowd favour, gain armour, and battle to the death. This game uses blended mechanics of deckbuilding, hand management, and a whole lot of ruthless “Take-that” combat”. Players draw cards which allow them to move their gladiators around the arena, and do combat with the rest of the contestants. Vanquishing other gladiators allows you to gain favour, and upgrade your deck with better cards, or rid yourself of weak ones. Sounds pretty basic, yet compelling. As the tagline suggests: Easy to Learn… Easy to Die! With a lot of positive buzz and feedback, Carthage has already made over half its funding goal of 19.500 Canadian Dollars after just 2 days – currently sitting at around CA$ 13K. The fully-fledged sequel to popular worker-placement title The Manhattan Project is finally on Kickstarter – titled The Manhattan Project 2: Minutes to Midnight. (And if you have no idea what the Nuclear Triad is, congratulations, you’re qualified to run for president). Unsurprisingly The Manhattan Project 2 has already been funded ($75K pledged on a $40K goal), with a whopping 25 days to go still. This week on CBQ Stuart reviewed the wonderful Santorini.